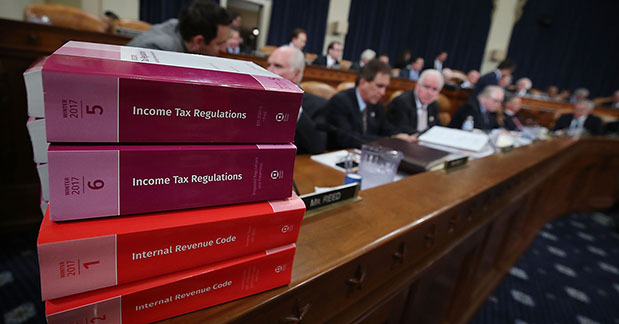 The House and Senate are moving towards a vote on final tax legislation. Several independent organizations have analyzed the budgetary effects of earlier House and Senate proposals (for a comparison of the provisions in the House and Senate plans, see here). Although the analyses relied on different models and reached different outcomes, they are unanimous in projecting that the legislation would add substantially to our national debt, which is already at $20 trillion and growing. Importantly, those findings hold under analysis of the bills on both a “static” and “dynamic” basis. A static analysis of a bill considers changes to revenues and outlays without taking into account macroeconomic effects. A dynamic analysis includes the macroeconomic effects of a bill and the resulting effects on the budget. Furthermore, in addition to the effects of the legislation as measured in the analyses, interest paid on the additional borrowing required to finance the legislative changes will potentially add another $250 billion to the cost over the next 10 years. * Learn more about how the Tax Foundation, Tax Policy Center, and Penn-Wharton arrive at these estimates. On November 16, the House passed their version of the Tax Cuts and Jobs Act. Some of the major features of the plan include reducing the current seven income tax brackets to four, eliminating the state and local tax deduction, limiting the mortgage interest deduction, and cutting the corporate tax rate. For more details on the plan as reported from the Ways and Means committee, see here. The Joint Committee on Taxation (JCT) estimates that, on a static basis, the bill would lower revenues by $1.4 trillion between 2018 and 2027. On a dynamic basis, the cost of the bill is estimated to be $1.0 trillion. The Tax Policy Center estimates that the bill would reduce federal revenues by $1.3 trillion over the 10-year period, on a dynamic basis (they started with JCT’s static estimate of a cumulative $1.4 trillion effect). The Tax Foundation estimates that the bill would reduce federal revenues by $1.1 trillion over the 10-year period, on a dynamic basis (and $2.0 trillion on a static basis). The Penn Wharton Budget Model estimates that the bill would lower revenues by $1.8 trillion on a static basis and by between $1.5 trillion and $1.7 trillion on a dynamic basis over 10 years. The Joint Committee on Taxation estimates that the bill would increase GDP in 2027 by 0.7 percent. The Tax Policy Center’s analysis of the House version of the Tax Cuts and Jobs Act finds that the bill would increase GDP in 2027 by 0.3 percent. The Tax Foundation’s analysis of the House bill reports an increase in GDP for 2027 of 3.5 percent and a 2.7 percent boost in wages in that year. The Penn Wharton Budget Model projects that the House bill would raise GDP by 0.4 to 0.9 percent relative to its projected value in 2027. Over the longer term, depending on the model used, Penn Wharton projects that such an increase will fade as a result of higher debt. The Joint Committee on Taxation estimates that all groups would see reductions in their taxes for the first few years, but in later years, some would see tax increases. The Tax Policy Center found that the House legislation would reduce taxes on average for all income groups, but that at least 24 percent of taxpayers would pay more taxes in 2027 than they would if no legislation were passed. The Institute on Taxation and Economic Policy also produced a report on the distribution of tax cuts in the House’s proposal, as introduced on November 2nd. They find that the largest share of the tax cuts accrue to those with the highest income. On December 2, 2017 the Senate passed its version of the Tax Cuts and Jobs Act. It differs from the House version of the bill in important ways. For example, the Senate version of the bill keeps the number of income brackets the same as under current law but changes the income groupings assigned to each bracket; it also would effectively repeal the individual mandate put in place by the Affordable Care Act. For more details on the plan, see here. The Joint Committee on Taxation estimates that the bill passed by the Senate on December 2 would, on a static basis, lower revenues by $1.4 trillion during the 2018–2027 period. An earlier version of the bill as reported by the Senate Committee on Finance was estimated to lower revenues by $1.0 trillion on a dynamic basis. The Tax Policy Center’s analysis reports that the bill as passed by the Senate would reduce federal revenues by $1.3 trillion over the 10-year period, on a dynamic basis. The Tax Foundation estimates that that the bill would reduce federal revenues by $0.5 trillion over the next 10 years, on a dynamic basis (using the version of the legislation released on November 9). The Penn Wharton Budget Model estimates that the bill would increase deficits by $1.7 trillion on a static basis and by between $1.2 trillion and $1.4 trillion on a dynamic basis over 10 years. The Joint Committee on Taxation estimates that the bill reported by the Senate Committee on Finance would increase GDP by 0.8 percent by 2027, though they note that the annual increase is expected to be diminish over time. The Tax Policy Center estimates that the bill passed by the Senate will have almost no effect on the size of the economy in 2027. The Tax Foundation’s analysis of the November 9 Senate bill found that it would increase GDP by 3.7 percent 10 years from now and would boost wages by 2.9 percent that same year. The Penn Wharton Budget Model estimates that that the Senate-passed bill would raise GDP by 0.5 to 1 percent relative to its projected value in 2027. The Joint Committee on Taxation estimates that under the legislation reported by the Committee on Finance all groups would see reductions in their taxes for the first few years, but by 2027, taxpayers earning under $75,000 would see tax increases. In addition, the Congressional Budget Office prepared an analysis of the distributional effects of changes in spending; that analysis showed reductions in federal spending for incomes below $50,000. The Tax Policy Center finds that the bill, as passed by the Senate, would reduce taxes for all income groups in 2019 and 2025, though the largest cuts would go to taxpayers in the highest income groups. By 2027, however, 48 percent of taxpayers would pay more in taxes compared with current law. The Institute on Taxation and Economic Policy has also produced a report on the distribution of tax cuts in the bill that the Senate Finance Committee ordered reported. They find that the largest share of the cuts accrue to those with the highest income. The House and Senate versions of the tax bill have been reconciled in a conference agreement that is expected to be voted on later this week. The final bill is estimated to increase deficits by $1.5 trillion over the next 10 years by permanently modifying business taxation and making a number of temporary changes to the individual income tax code. See the summary from the Congressional Budget Office and the estimate from the Joint Committee on Taxation for details.